Plants flowering 0.1--0.3 m. Leaves spreading, bright green, 8--15 cm, somewhat chalky, especially toward base; sheath pale, elliptic; blade subtriangular to narrow triangular, apex acuminate. Inflorescences: scapes decurved; bracts subfoliaceous, laxly imbricate; inflorescences single spikes (in flora), spikes 3--10-flowered, pendent; floral bracts green, elliptic, 1.4--1.5 cm. Flowers nocturnal; sepals green, broadly elliptic, 1--1.2 cm, thin-leathery, apex obtuse, surfaces glabrous; petals widely spreading, bright yellow, ligulate, 2--2.4 cm; style included, stigma erect, simple. Fruits ovoid, 1.2--2 cm. Flowering fall--winter. Epiphytic in shady, humid hammocks; 0--30 m; Fla.; Mexico; West Indies; Central America; South America. 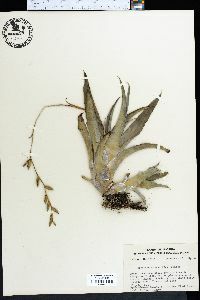 Catopsis nutans is rare in the flora.